Pre-primary ballet through to advanced. 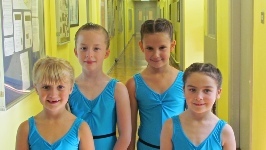 Tap/Modern classes - Pre-primary through to advanced. Classes are held in the Main Hall, Bridgemary School, Wych Lane, Gosport, and the Methodist Church, Bridgemary. These may be paid weekly, half termly or for the full term. These must be paid at the beginning of lesson or term. (Please note cheques are only accepted for fees paid by the term.) ALL missed lessons must be paid for. There is a uniform for both ballet and tap, once you have enrolled your daughter/son you will be expected to equip them with the correct items. All items are regulation in style and colour, lists of exact requirements are available on request, or go the the uniform page. Uniform can be purchased at the dancing school. Parents are not normally permitted to watch classes but open days will be arranged periodically where practical. Pupils may take examinations when they have reached the required standard, if parents wish them to.